Here’s another popsicle. It’s time for a green one. See the short ingredient list for the “Avocado-Lime Ice Pops,” from the July 2016 issue of Bön Appetit. Nothing fancy here. Nothing intimidating. Let’s start with the virtue of the ripe avocado. Taste it. Remind yourself of what it is: a thick, buttery cream that coats your mouth with satisfaction. This is the charm that translates to the popsicle. Creaminess. Your blender will be challenged by the thick avocado, but let it grind. The amount of “packed” mint leaves is significant also, but the lime juice and simple syrup will help the blender a bit. Remember, simple syrup is equal parts sugar and water that you’ve melted down and kept in your fridge for these types of popsicle situations. Once frozen on the stick, you’ll take your first bite and be floored by the tartness. Wow! The lime and the mint punch you in the face. The avocado isn’t a flavor, so much as a texture. 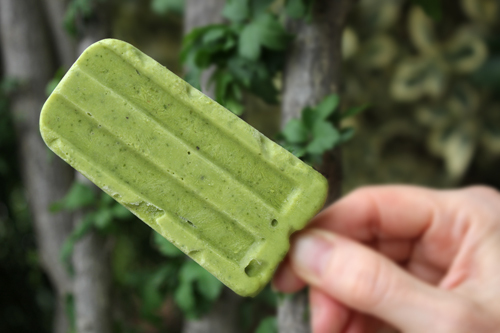 You’re getting a “Mint Lime Popsicle” here. It’s a nice trick. Enjoy it.